In the summer, my wife Marie, after suffering hearing loss in her left ear, was diagnosed with having a cholesteatoma. My best description of this little bugger is that it's a non-malignant but bone-eating ear tumor. In Marie's case, surgery to remove it in August showed that it had wreaked havoc, destroying her hearing bones. Worse still, it had eaten into the dura mater, which is the lining that surrounds and shields the brain. The surgeon saw brain tissue leaking into the ear cavity. The upshot was that she needed reconstructive brain surgery--and that took place this past Wednesday, the 12th. After such surgeries, it is necessary for the patient to spend some time in the ICU, to monitor potential brain swelling. Marie was there for three days, during which time I named her the "perkiest ICU patient ever." She has since moved to a regular room in the hospital, with the hope that she will go home today. I have been doing my best to support her, as well as ensure that the lives of my three sons remain as normal as possible. Hence my spotty internet presence. I know you'll tell me to chill, but I do feel bad that I haven't been replying to your comments--or worse, visiting your blogs these past few weeks. I so value the sense of community our Marvelous Middle Grade Monday has created!! While Marie recovers at home, I've decided to put Middle Grade Mafioso on hold until the new year. (It's time for a holiday break, anyway.) I send you my best wishes for the holiday season and for 2013. Right now, the Don's carving slices of panettone, which we intend to eat in your honor. So to all of you: Buon Natale e felice anno nuevo! See you in 2013!! Read with my 9-year-old as part of the Oregon Battle of the Books 2013 project. There was a lot of word-of-mouth about this book, and my son was eager to read it. It didn't disappoint! Opening lines: Words. I'm surrounded by thousands of words. Maybe millions. What I liked: Words are indeed the stuff of Melody's life. She is a genius trapped in a body that doesn't work because of cerebral palsy. I found her voice to be engaging, and her struggles and triumphs to be believable. She has loving parents, who nonetheless have issues trying to care for her and to understand her. The major plot point has to do with Melody qualifying for her school's trivia team, and the reactions which ensue. I appreciated that the whole thing didn't spiral down into a Hallmark moment, and that there was a setback and a near tragedy. I found the experience of reading it as being similar to WONDER--as in I should have shares in Kleenex! This is a five-hanky one!! My son was eager to read this every night. He too found the character of Melody appealing, and enjoyed the humor. The mean girls also got a well-deserved raspberry from him. I'd recommend this for 4th grade and above. If you want to know more about the author here's an interview with Sharon M. Draper at Goodreads. Happy Marvelous Middle Grade Monday Everyone!! Buongiorno a tutti! We're all excited here at Middle Grade Mafioso because it's the Don's birth week and on the 7th, he's hosting a massive party. I can't wait for the cannoli. 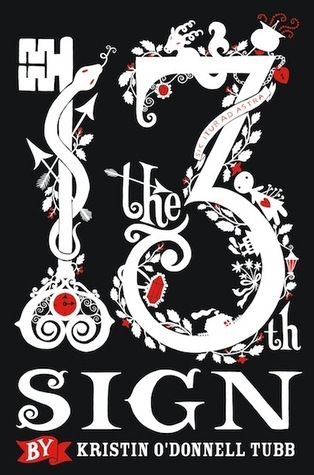 It's also our day to host Kristin O'Donnell Tubb's THE 13TH SIGN Preorder Contest! This may in fact been one of the most fun blog tours ever. Because The 13th SIGN has astrology at its core, Kristin came up with a wonderful idea to both promote her forthcoming novel as well as raise money for the charity Reading Is Fundamental, a literacy program committed to placing books in the hands of kids who need them most. What if you were the one who accidentally unlocked the 13th sign, causing this world-altering change, and infuriating the other 12 signs? Jalen did it, and now she must use every ounce of her strength and cunning to send the signs back where they belong. Lives, including her own, depend upon it. I tried hard to find a Capricorn, but they were shy. Which makes sense. According to my astrology book, CAPRICORN characteristics include being ambitious, trustworthy, calm, a loner, pessimistic, and determined. Yup, the Capricorns on Twitter were in total loner mode. And Michelle Obama, Kate Middleton, and Orlando Bloom never got back to me. What is this contest all about? Preorder THE 13TH SIGN! You can preorder it through Amazon, Barnes & Noble, Indiebound, or through your local independent bookstore. Then email your receipt TO KRISTIN at ktubb@comcast.net. You will be entered into that day’s drawing, the grand prize drawing, and your purchase will be *matched* by a $1.00 donation to RIF! Are there other ways to enter the contest? BUT. You have to preorder THE 13TH SIGN to enter to win the grand prize and to have your purchase matched with a RIF donation. ALSO. To make sure you get the correct amount of entries, please let Kristin know if you’ve done any of the above! You can email her at ktubb@comcast.net with everything you’ve done to enter. A Nexus 7 ereader! BOOM. The grand prize winner will be announced on Kristin’s blog on Friday, December 7. How long does the preorder contest last?